The early Romans grew purple and white carrots, but it is believed that the first purple carrots came from Afghanistan, Pakistan and northern Iran. Purple, white and yellow carrots were imported to southern Europe in the 14th century and were widely grown in Europe into the 17th Century. Our familiar orange carrots only appeared in 16th century Holland when patriotic Dutch growers used seed from purple carrots and yellow Turkish carrots to produce orange roots, reflecting the colour of the ruling House of Orange. 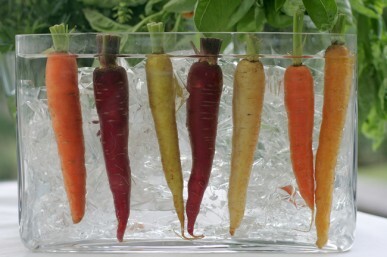 Over the ensuing centuries, orange carrots came to dominate and carrots of other colours were only preserved by growers in remote regions of the world. Purple and white carrots still grow wild in Afghanistan where they are used by some tribesmen to produce a strong alcoholic beverage. Carrots are biennials that grow with the typically deeply divided bright green leaves in a dense clump with one long plump ‘carrot’ root to each clump. The edible roots have vibrant orange, red, yellow, white or purple skins, some with bands of orange, yellow and purple flesh in the centre. The flavour is sweet and spicy and they are all great for salad, juicing and roasting. The root colour comes from pigments in the roots that have known health-giving properties. Orange and yellow roots contain beta-carotene, red roots contain lycopene and purple, anthocyanins which act as anti-oxidants to protect the body. In the second year, if the carrots are not harvested, then strong upright leafy flower stems will grow from the centre of the clump. The flowers of purple carrot varieties are typically rose-pink to lavender while orange carrots have white flowers. They all occur in umbrella-like flower heads in late summer and can make a delightful addition to the flower garden as well as attracting beneficial insects. 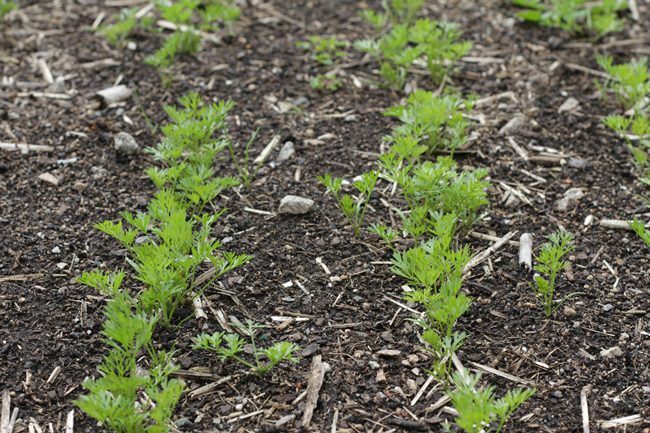 All carrots like a sunny position and light well-drained soils without lumps or stones that might cause the roots to split. Add compost and well-rotted manure before planting, and water regularly. Grow carrots from seeds sown directly into the soil from September to February in rows 20 cm apart. Seed can take a while to germinate so cover with some shade cloth to stop them from drying out. Thin seedlings so that there is about 10 cm between each plant. 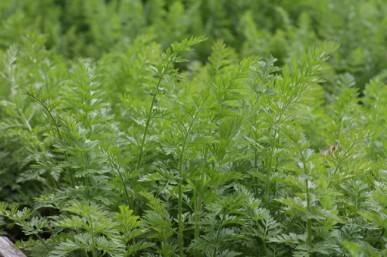 Start harvesting young carrots after about two months. Heirloom purple, yellow, red and white as well as orange varieties of carrots can be purchased from Diggers Seeds , Green Harvest and The Lost Seed . Heirloom vegetables are often easier to grow, more robust and better yielding making them perfect for the home gardener. Some of the purple varieties that are available from other sources are F1 hybrids which means you won’t be able to collect viable seed to sow the following year. Look for heirloom carrots like: Purple Dragon, White Belgian, St Valery, Western Red, Scarlet Nantes and Mini Round. This last is perfect if you have difficult soils (lumpy and not so well drained) or if you want to grow in a pot. For everything else that you ever wanted to know about carrots, go to the World Carrot Museum website.